“When Is Hot Water Too Hot?” – a safety brochure related to preventing scald injuries to young children in the home. NHTSA has a bicycle safety program directed toward reducing bicycle injuries and fatalities through education, enforcement, outreach and legislation. Offers safety tips, news and facts for health and safety experts, educators, corporations, foundations, governments and volunteers to educate and prevent accidental childhood injury. Magnets found in many toys are strong enough to attract one another or other metal objects through body parts creating unique dangers particularly if swallowed. If two or more ingested magnets, or one magnet and a magnetic piece such as a steel ball, attract in the intestines, they can pinch the intestinal walls cutting off the blood supply resulting in a perforation (hole). Twisting of the intestine and blockages can also result from swallowed magnets. Be extremely careful in purchasing toys containing magnets and vigilant in watching children while playing. Keep any small magnets away from children younger than 6 years old, particularly if the child has a tendency to put objects in his or her mouth. Children should never use magnets to emulate tongue, lip or nose piercings. Children have also been known to use their teeth to pry apart two magnets. Survey the child’s play area, and if a magnet has become dislodged or if there is a magnet missing, stop using the toy immediately. Head Over Heels – Wear Your Helmet! A head injury can quickly turn a fun outing into a disaster. Bicycles, scooters, skateboards, winter activities like skiing and snowboarding and other activities can be potentially dangerous. According to CPSC’s 2004 estimates, bicyclists received about 151,000 head injuries that were treated in U.S. hospital emergency rooms. Skateboarders visited hospital emergency rooms with about 18,000 head injuries. Many of these injuries could have been prevented through proper helmet usage. Wearing a bicycle helmet while biking, for example, can reduce your risk of head injury by 85 percent, and reduce the risk of brain injury by 88 percent, according to a study published in the New England Journal of Medicine. There are different helmets for different activities. Be sure to wear a helmet that is appropriate for the activity. Some kids love to climb and can use drawers and shelves on furniture and TV stands as steps. A child’s weight can cause a TV or piece of furniture to tip-over, leading to serious injury or even death. Prevent tip-overs by ensuring furniture is stable on its own. For added security, anchor furniture and TV stands to the floor or wall with appropriate hardware, such as brackets. Place televisions as far back as possible on sturdy furniture appropriate for the size of the TV or on a low-rise base. Place electrical cords out of a child’s reach, and teach children not to play with the cords. Remove items that might tempt kids to climb, such as toys and remote controls, from the top of the TV and furniture. A one-page alert describing the dangers of magnets and injury prevention tips. There are different helmets for different activities. Each type of helmet is made to protect your head from the impacts common to a particular activity or sport. This publication helps you choose the correct helmet. A safety alert offering tips on preventing furniture or TV tip-overs. 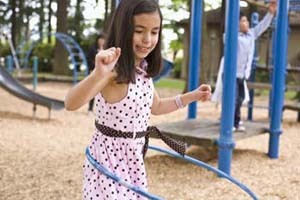 Safety information you need to know about planning, constructing, and maintaining an outdoor home playground. The Chemical Exposures Subcommittee works to understand and predict disease and disabilities from changing chemical exposures and metals, including lead, to children across their life stages.